This week I had a chance to finish and get some photos of the crab lock I made while assisting Peter Ross' class at Haystack. Locks are something that I have just started to make in the past year, but have been fascinated by for sometime now. The first time I recall being truly moved by iron work was seeing antique locks at a museum in Rouen, France. The museum is called Musée Le Secq Des Tournelles, and is dedicated to objects made from iron. They have everything from gates and grates to thimbles and corkscrews. Their collection of locks is a sight to behold though. 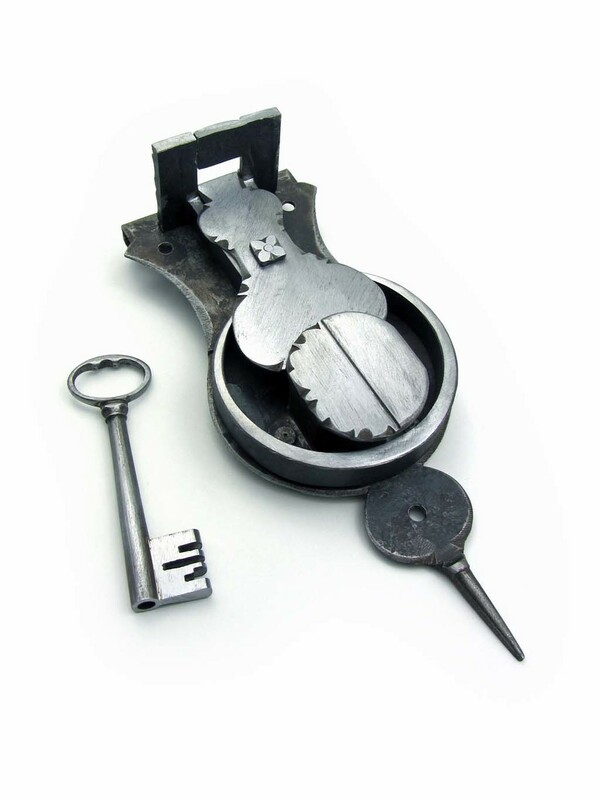 In it are both finished and unfinished locks and keys which I believe are all European and dated before the 18th century. These are true masterpieces. Although I did not understand how the locks were made or how they operated when I visited the museum, I did recognize their refinement and exceptional workmanship. Studying them made me begin to question what I knew of iron so far and realize the material in a whole new way. Now that I have more knowledge and experience under my belt I am dying to return to the museum with new inquiries. Until then I will just keep studying the books and plugging away at the bench!